“This one $40, this one $30 … that one $20!” The owner of the street stall, a man of about 30 years wearing a traditional longyi tied around his waist, is gesturing at a phone that looks, to my eyes, like a mid-range Android phone. It bears the brand Singtech, a brand among myriad others you’ve probably never heard of, and a stick on the screen show app icons for Facebook, WhatsApp, Twitter and Yahoo. The centre of Yangon, in Myanmar, is dominated by Sule Pagoda, a golden stupa Buddhist shrine that hosted a ‘saffron revolution’ of monks in 2007 on the country's slow path towards democracy. But the stupa is not the most important gleaming icon here. That honour goes to the curved shapes of aluminium and polycarbonate on sale on almost every street stall on Mahabandoola Road. 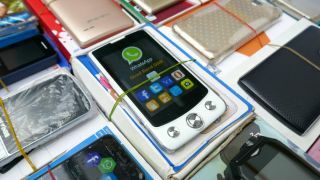 Myanmar is now the land of the $20 smartphone. Chances are you’ve never seen so many phones in one place. So why so many, and why so cheap? “People here often have a couple of phones for multiple SIM cards because when the mobile networks were being built a few years ago that was the only way to ensure connectivity wherever you went in the country,” says Brad Jones, CEO at Wave Money, a joint financial technology venture between Yoma Bank and Norwegian mobile network operator Telenor. Now, 80% of the population gets a 3G signal, and in urban areas, 4G. The real revolution here isn't democracy, but the influx of the phone. But there’s still work to be done by the networks, so having two devices remains common. It’s all happened virtually overnight. Prior to 2012, Myanmar – which shares borders with India, Bangladesh, China and Thailand – was ruled exclusively by the military, but is now in transition from military dictatorship to a civilian-led administration. Back in 2012, SIM cards cost $2,000 each. GSMA Intelligence rated Myanmar as the third-least penetrated mobile market in the world. Everything changed in 2014 when Telenor and Qatar telecommunications company Ooreedo entered Myanmar, building extensive 3G mobile networks (Myanmar skipped 2G completely) alongside the state-owned network of the Ministry of Posts and Telecom (MPT). Millions of SIM cards then went on sale for just 1,500 kyats ($1.50) each, and can be topped up for just 1,000 kyats ($1). Phone ownership went from zero to 50% almost overnight. Having leapt straight into the smartphone age, the country is unencumbered by years of legacy infrastructure, which many think leaves it ripe for innovation. “With a growing population of over 53 million people and an equally growing middle class, Myanmar is constantly in search of new technology to use,” says Stuart Thornton, VP Business Development for Asia-Pacific at Worldpay. Read that again. Some 80% percent of people use the internet, up from almost no one just a few years ago. They're all doing it on phones – computers and laptops are very rare here – and 80% of those phones are smartphones. Smartphone penetration is 79% in the USA and 77% in the UK, figures that have taken a decade to reach. Myanmar has done it in under two. Posters across the country advertise data packages that verge on a giveaway, going as low as one kyat per megabyte – that’s $0.00072. “I suspect multiple SIMs are being used to [make use of] the best deals,” says Jones, who adds that the fierce competition between the mobile networks are the reason data is so cheap. Network loyalty here is almost unheard of, as are domestic fixed landlines (just 4.8% of the population has access to a landline phone); the public phone stands on the streets of Myanmar, once the nation’s only means of communication, are now empty. And all this in a country where only 49.5% of homes have a TV. It's not all about cheap phones; there are a smattering of reasonably high-end smartphones selling from bricks-and-mortar shops, such as Samsung’s J7 and J5 Prime handsets, Oppo’s F1s ‘Selfie’, Vivo’s Y55, ZTE's Smart L110, and various phones from Huawei, one of the top-selling brands. These handsets have better cameras, superior build quality, dual SIMs, and massive poster campaigns promoting them. I did spot one second-hand iPhone 6 going for $130, but that kind of deal is a massive exception here; what really sets Myanmar apart in south Asia is that all of its smartphones are brand new.